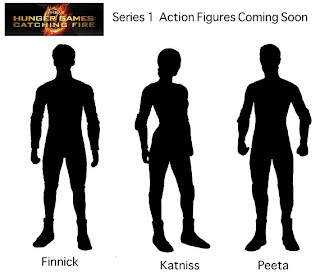 NECA have announced that they will be releasing 6 3/4" action figure toys of Katniss, Peeta and Finnick. Apparently they will be outfitted in their black and grey arena uniforms. Accessories include a bow and arrow for Katniss and a trident for Finnick! "You can get in on the rebellion with this first series of highly detailed, poseable Catching Fire action figures. The Series 1 assortment includes Katniss, Peeta and Finnick in their new black and grey arena uniforms. Based directly on the movie, they feature the likenesses of the actors and are accurate to their on-screen depictions." They will be released as part of NECA's merchandise range for Catching Fire in November 2013. Thanks to The Hob for the tip!